"Hungry Ghost - Part Two: Blood Sisters"
A spiky-haired girl walks through suicide slum singing a song. She bumps into a man and steals his wallet. Cheerily she tosses the wallet over her shoulder and counts her new cash. Traci-13 yells at Natasha to back off, her hands crackling with energy. 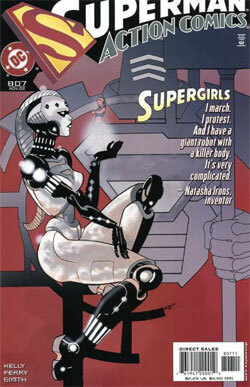 Natasha, inside the new Steel costume, now dozens of stories tall, tells Traci to step away from Superman. Quickly, the two girls figure out that both of them are on the same side. As they begin to talk, Superman begins to convulse again. Natasha tells them to duck and, shrinking down to normal size, she jumps through the window. She hovers a hand over Superman's body and delivers a quick jolt of electricity, starting his heart beating again. Lana holds his hand when suddenly the secret service bursts into the room and orders everyone down. Lana tries to warn them off, but suddenly both agents find themselves falling through the floor. Then up in their places come a handful of ninjas and Byakko. Across town the spiky-haired girl admires her new bleeding-S tattoo on her forehead. The tattooist comments that she must really hate Superman, and she tells him that he has no idea. As she lies back the tattooist comes closer to her and leans a hand out to her body. Before he can touch her though there is an explosion of light and the girl suddenly vanishes, to be replaced by Supergirl. Cir-el tells the man to keep his hands of off young impressionable girls before she disappears through the door. Natasha fends off the ninjas while Traci counters Byakko's advances with a magical force field. Traci taunts the villain, and in retaliation Byakko buries two daggers in Nat's back. Traci quickly heals Nat, but in the interim Byakko moves forward and grabs Lana. Lana asks her why she wants to kill Superman, and Byakko tells her that she is only a hungry ghost. Bounding across the room Byakko grabs the spear Superman is impaled on and rips it out of his body. Traci weaves a spell and possesses Superman for a moment, and unleashes his heat vision. A fireball bellows out of the apartment building. As they reel from the blow, Nat quickly enlarges and tries to hold up the complex. As she realizes that she can't hold it alone, Supergirl suddenly appears on the scene and offers her help. Inside, Cir-el introduces herself to Lana and Traci when Byakko suddenly reappears. Superman challenges her, but Byakko simply increases her gravity and sends her plummeting through the floor. Traci weaves another spell and enlarges her lizard, having Leroy feast on the ninjas. Natasha sticks a hand into the room and tells everyone to vacate. The building has been evacuated and in a few seconds it is coming down. Outside the three girls gather themselves together to meet Byakko's next attack. Natasha tries to force her back, but Byakko ghosts herself and sends two blades flying. One pierces Superman's chest while one strikes Lana. Byakko vanishes, leaving the girls to mop up. Somewhere else, Byakko studies a picture of her husband and tells him that soon Superman will be dead and she will walk with him again. Story - 1: Let's piece together all of the elements in this story. We have Traci-13, who is an annoying character that I don't think anyone likes (if anyone does, please email me, because I honestly don't think anyone does, anywhere). We have Natasha, who while cool as a supporting character to Steel is definitely not so on her own. We have a new, female Steel costume that somehow can grow to be 25 stories high. Where did that come from? We have the new Supergirl, who I don't like, and I don't think anyone else does either. Throw in Byakko from one of the worst issues of Action last year and a three-issue series when one issue would be more than enough and that all adds up to a whole lot of nothing. This issue offered nothing at all. In fact, I didn't even read it until tonight (a week after buying it), and I only read it so I could write this review. We have an issue that has our hero getting stabbed left and right by a no-name villain while a group of teenie-bopper "heroes" (and I use that very loosely) run around like headless chickens. I've completely given up on Kelly. He is skilled, very skilled actually. His run on X-men years ago was top-notch and the first two years on Action were terrific. His stuff lately though is average at best, and normally it's a lot worse. Let's just say I will be glad to have him move on to other things. Art - 2: I would have rated this art average, but a couple of things really bothered me about this issue. First off, Traci continues to look horrible. Secondly, Lana looks pretty bad throughout the issue too. Superman didn't look too great either. The two things that really bothered me though were on page 9 the tattoo mysteriously vanishes from the girl's head, and on page 13 Superman looks completely expressionless as he unleashes a blast of heat vision. I realize he was possessed, but I would think that Traci's emotions would have come through too. I normally enjoy Ferry's art a lot more than this, but I really didn't like it in this issue. Maybe it was just the story ruining it for me, but I really didn't enjoy it. Cover Art - 2: The logo is horrible. I realize that's an old gripe around here, but it really caught my eye on this issue so I'll mention it. Then we have a boring background with the Aegis (which isn't around anymore) and the horrible new Steel armor. The worst part though is the quote from Natasha. That was just corny. The reason this cover didn't get a 1? Very simply, this cover has 100% less "Abrakadizzle". Anything is a step up from that. I'd like to gripe more about this issue, I really would, but it's gotten to the point that it's hardly worth it anymore. Let's just say it's only a few more months until we see some new blood on the books, and all we can do is really hope that they turn out to be better than the crap we are getting now.